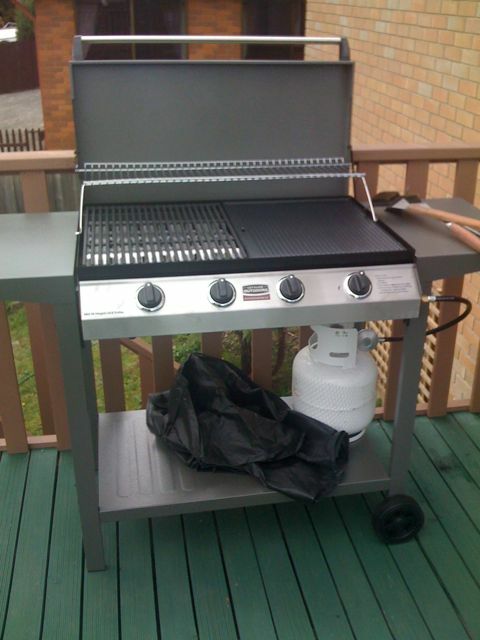 Just quickly, I thought I would show you all a photo of my new gas BBQ! It is such a pleasure to cook on, because just like gas in the kitchen, the BBQs temperature is so much easier to controll. With our other home-made BBQ, which uses coals to cook on, it was usually way too hot (especially for something like the marinated chicken wings we had on Saturday) so we used to raise the grate up off the body of the BBQ which was quite a risky thing to do… One wrong move & there goes all the food! So overall, very satisfied & can’t wait to use it again! This entry was posted on October 13, 2008 at 11:03 am and is filed under Evening Meal. You can follow any responses to this entry through the RSS 2.0 feed. You can leave a response, or trackback from your own site.